This syndrome of diabetes sweating excessively after eating is often related to nephropathy, peripheral neuropathy and dysautonomia. Gustatory sweating, a complication of diabetes that is related to nerve damage, is indicated by sweating when one chews food. Sweating could be more around neck and chest region. It was observed first observed in diabetics pursuing autonomic neuropathy. Gustatory sweating may be severe, which can be produced by several foodstuffs. Cheese could be regarded as the most powerful stimulus among all. The sweating often involves sweating of scalp, neck and chest along with profuse sweating on either sides of the face. The actual reason of sweating is not known, but studies indicate there is a fair chance of it being related to high blood glucose for a long time. Health experts advise medication and a topical cream help to resolve the gustatory sweating. According to the American Diabetes Association, the most common foods to cause sweating are cheese or chocolate. Spicy pickles, alcohol, vinegar, fresh fruits and salty foods can also make diabetes sweat. The International Hyperhidrosis Society refers hot spices as a trigger of gustatory sweating and recommends limiting these. Chewing is another trigger, which can make diabetes sweat around their face, scalp and neck. A report by the International Hyperhidrosis Society on gustatory sweating recommends avoiding caffeinated beverages, carbonated drinks, as they may trigger an excessive sweating response. Instead, diabetics should have plain drinking water, natural juices and herbal teas to hydrate themselves and keeping excessive sweating condition in control. 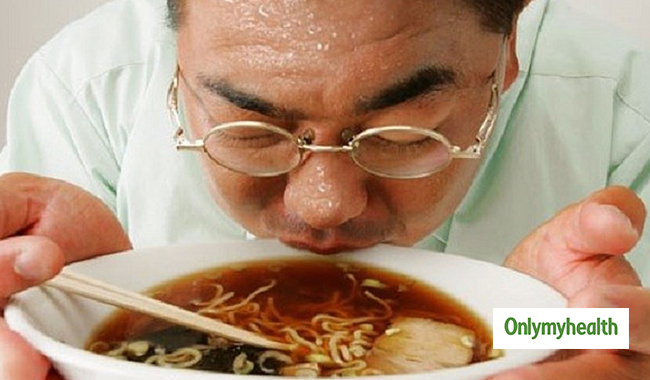 Foods with monosodium glutamate (MSG) could trouble diabetics and make them sweat. Researchers have been trying to get to the root of the problem. They recommend keeping blood glucose in the normal range and avoid specific foods prevent sweating caused by food. To know which spicy foods are particularly bad for your body's condition, diabetes should maintain a food dairy. Diabetes should never stop eating to prevent sweating owing to fear of embarrassing and ill-timed sweating situation. Cutting on eating or skipping meals can have negative impact on blood sugar control. Therefore, health experts advise sticking to their dietary schedule and not skipping meals no matter what. Not all spicy foods or caffeinated beverages cause gustatory sweating; the reason for it could be the subtle ingredient. The approach to manage gustatory sweating condition is understanding affect of food on sweating level and what is the impact when these are ignored.